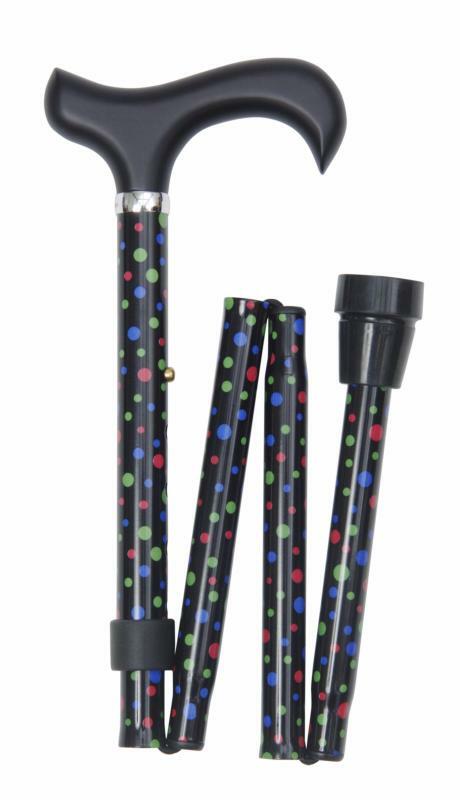 A sassy, fashionable folding cane that is ideal for the young and the young-at-heart. The elegant derby handle offers excellent support to the hand. The strong, aluminium shaft folds easily so the cane can be conveniently stowed away when not required. The shaft features a black background patterned with bright pink, purple-blue and green polkadots of various sizes. The handle is black, and the stick is fitted with a smart metal collar and a black, non-slip rubber ferrule. A robust folding cane, suitable for everyday balance and support, its height is adjustable between 79-89cm (approximately 31-35").